The works of Avicenna, the greatest of the medieval Persian physicians, played a crucial role in the European Renaissance. (980-1037 C.E. ), often referred to by his Latinized name Avicenna, was a Persian physician, philosopher, and scientist. He was one of the major Islamic philosophers and his philosophical writings had a profound impact on Islamic philosophy and on medieval European scholasticism. Avicenna integrated the ideas and methodologies of Aristotle, Neoplatonism, and other Greek philosophy with the monotheistic tradition of Islam. Avicenna adopted Neoplatonism's theory of emanation, but he made a distinction between God and the Creation in order to avoid the Neoplatonist tendency towards pantheism. He was one of the first to apply philosophical logic to Islamic theology, and his writing provoked a strong reaction from later Islamic theologians. Nevertheless his works became standard textbooks in the madrasa (schools of the Islamic world). Avicenna is also well known for his medical work, The Canon of Medicine, also known as the Qanun (full title: al-qanun fil-tibb), which was translated into Latin in the twelfth century, and was used for several centuries in medieval Europe and the Arab world as a major medical textbook. He was the author of 450 books on a wide range of subjects. He wrote three encyclopedias of philosophy, the most famous of which is al-Shifa’ (The Cure). Extensive biographical materials are available on Avicenna’s life; some of the information may be exaggerated, both because he later became a legendary figure in the Islamic world, and because his own autobiography may have been intended as an illustration of his theories of learning and knowledge. The autobiography covers the first 30 years of his life, and the later years are documented by his secretary and disciple, Juzjani. Avicenna was born in 370 AH /980 C.E. in Kharmaithen near Bukhara, now in Uzbekistan (then Persia). His father, a respected Ismaili scholar, was from Balkh of Khorasan, now part of Afghanistan (then also Persia) and was at the time of his son's birth the governor of a village in one of Nuh ibn Mansur's estates. He had his son very carefully educated at Bukhara. Avicenna was put under the charge of a tutor, and he displayed an exceptional intellect, memorizing the Qu'ran and Persian poetry by the age of seven. He learned arithmetic from a grocer, and studied medicine with a wandering scholar whose livelihood was curing the sick and teaching the young. By the age of 14, Avicenna had learned all that he could from his teachers, who were influenced by the Ismaili branch of Islam. Avicenna had an inquiring mind and was troubled by metaphysical problems and in particular the works of Aristotle. For the next year and a half, he studied philosophy, in which he encountered numerous difficulties. At such moments, he would leave his books, perform the requisite ablutions, then go to the mosque, and continue in prayer until understanding came to him. Deep into the night he would continue his studies, stimulating his senses by occasional cups of goats' milk, and even in his dreams problems would pursue him and work out their solution. It is said that he read through the Metaphysics of Aristotle 40 times, but its meaning was hopelessly obscure to him, until one day he bought a little commentary by al Farabi at a bookstall for the small sum of three dirhems. So great was his joy at this discovery, that he hastened to return thanks to God, and bestowed alms upon the poor. He turned to medicine at 16, and not only learned medical theory, but by attendance on the sick, according to his own account, he discovered new methods of treatment. The teenager achieved full status as a physician at age 18 and found that "Medicine is no hard and thorny science, like mathematics and metaphysics, so I soon made great progress; I became an excellent doctor and began to treat patients, using approved remedies." The youthful physician's fame spread quickly, and he often treated patients without asking for payment. Avicenna’s first appointment was that of physician to the emir, whom he helped in his recovery from a dangerous illness (997 C.E.). Avicenna's chief reward for this service was access to the royal library of the Samanids, well-known patrons of scholarship and scholars. When the library was destroyed by fire not long after, the enemies of Avicenna accused him of burning it, in order to forever conceal the sources of his knowledge. He continued to assist his father with financial matters, and began to write some of his earliest works. When Avicenna was 22 years old, he lost his father. The Samanid dynasty came to its end in December 1004. Avicenna appears to have declined offers of employment from Mahmud of Ghazni, and proceeded westwards to Urgench in the modern Uzbekistan, where the vizier, regarded as a friend of scholars, gave him a small monthly stipend. The salary was inadequate, however, so Avicenna wandered from place to place, through the districts of Nishapur and Merv to the borders of Khorasan, seeking an opening for his talents. Here he met his disciple and scribe, Juzjani. Shams al-Ma'äli Qäbtis, the generous ruler of Dailam, himself a poet and a scholar, with whom Avicenna had expected to find asylum, was starved to death by his own rebellious troops, and Avicenna himself was stricken by a severe illness. Finally, at Gorgan, near the Caspian Sea, Avicenna met with a friend, who bought a dwelling near his own house, in which Avicenna lectured on logic and astronomy. Several of Avicenna’s treatises were written for this patron; and the commencement of his Canon of Medicine also dates from his stay in Hyrcania. Avicenna subsequently settled at Rai, Iran, in the vicinity of modern Tehran, (present day capital of Iran), the home town of Rhazes; where Majd Addaula, a son of the last emir, was nominal ruler under the regency of his mother (Seyyedeh Khatun). Thirty of Avicenna's shorter works are said to have been composed at Rai. The constant feuds between the regent and her second son, Amir Shamsud-Dawala, however, compelled him to leave the place. After a brief sojourn at Qazvin he passed southwards to Hamadãn, where the emir had established himself. Avicenna first entered into the service of a high-born lady; but the emir, hearing of his arrival, called him in as medical attendant, rewarded him with gifts and even appointed him to the office of vizier. Then, for some reason, the emir banished him from the country. Avicenna remained hidden for 40 days in a sheikh's house, until the emir again fell ill and restored him to his post. During this difficult time, Avicenna persevered with his studies and teaching. Every evening, he dictated extracts from his great works, the Canon and the Sanatio, to his pupils and gave commentaries. Upon the death of the emir, Avicenna ceased to be vizier and hid himself in the house of an apothecary, where he continued the composition of his works. He had written to Abu Ya'far, the prefect of the dynamic city of Isfahan, offering his services. The new emir of Hamadan heard of this correspondence, discovered Avicenna's hiding place, and incarcerated him in a fortress. There was an ongoing war between the rulers of Isfahan and Hamadãn; in 1024 the former captured Hamadan and its towns, expelling the Turkish mercenaries. When the storm had passed, Avicenna returned with the emir to Hamadan, and carried on his literary labors. Later, however, accompanied by his brother, a favorite pupil, and two slaves, Avicenna escaped from the city in the dress of a Sufi ascetic. After a perilous journey, they reached Isfahan, and received an honorable welcome from the prince. The remaining ten or twelve years of Avicenna's life were spent in the service of Abu Ya'far 'Ala Addaula, whom he accompanied on numerous campaigns as physician and general literary and scientific adviser. During these years he began to study literature and philology, apparently because of criticisms of his style of writing. A severe colic, which seized him during the march of the army against Hamadãn, was checked by remedies so violent that Avicenna could scarcely stand. When the disease returned, he refused to keep up the regimen imposed and resigned himself to his fate. His friends advised him to take life moderately, but he rejected their advice, saying, "I prefer a short life with width to a narrow one with length." He is said to have enjoyed wine and his slave girls. On his deathbed remorse seized him; he bestowed his goods on the poor, restored unjust gains, freed his slaves, and every third day till his death listened to the reading of the Qur'an. He died in June 1037, in his fifty-eighth year, and was buried in Hamedan, Persia. 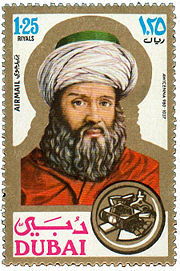 Portrait of Avicenna is seen depicted on a stamp issued by the United Arab Emirates. Al-Qifti states that Avicenna completed 21 major and 24 minor works on philosophy, medicine, theology, geometry, astronomy and the like. Another source (Brockelmann) attributes 99 books to Avicenna comprising 16 on medicine, 68 on theology and metaphysics 11 on astronomy and four on verse. Avicenna’s two earliest works, written under the influence of al-Farabi, are Compendium on the Soul (Maqala fi’l-nafs), a short treatise on the intellect, and Philosophy for the Prosodist (al-Hikma al-‘Arudiya), his first book on Aristotelian philosophy. He later wrote three encyclopedias of philosophy. Written at the request of his students, al-Shifa’ (The Cure) (completed in 1027), was modeled on the works of Aristotle. Its Latin translation was widely read by medieval European scholars. Two later encyclopedias were written for Avicenna’s patron, Abu Ya'far 'Ala Addaula. Danishnama-yi ‘Ala’i (The Book of Knowledge for ‘Ala’ al-Dawla), written in Persian, is intended as an introduction to philosophy and became the basis for Goals of the Philosophers, by the later Islamic theologian, al-Ghazali. The other, al-Isharat wa’l-Tanbihat (Pointers and Reminders) discusses logic and metaphysics. Two other works, al-Insaf (The Judgement) and The Easterners (al-Mashriqiyun) or The Eastern Philosophy (al-Hikma al-Mashriqiya) , written at the end of the 1020s, were said to have articulated radical philosophical ideas but the original texts have mostly been lost. Avicenna wrote at least sixteen works on medicine. His fourteen-volume Qanun (The Canon of Medicine) and portions of the encyclopedias were translated into Latin as early as the twelfth century, by Gerard of Cremona, Dominicus Gundissalinus, and John Avendeath; they were published at Venice, 1493-95. The complete Arabic texts are said to be in the manuscript in the Bodleian Library. An Arabic text of the "Canon" and the "Nadja" was published in Rome, 1593, and a Hebrew version at Naples in 1491. Of the Latin version there were about thirty editions, founded on the original translation by Gerard of Cremona. In the 15th century a commentary on the text of the Canon was composed. Other medical works translated into Latin are the Medicamenta Cordialia, Canticum de Medicina, and the Tractatus de Syrupo Acetoso. The Canon was used as a standard medical text in Western Europe for several centuries. Avicenna is one of the foremost Islamic philosophers and one of the first to attempt a correlation between philosophy and religion. He expounded the Neoplatonic concept of emanation, but rejected other Neoplatonic ideas such as the pre-existence of the soul, and used Aristotelian logic to develop his arguments. Avicenna rejected the classical Islamic theological doctrine of creation ex nihilo, and instead developed the Neoplatonic idea of emanation. He argued that cosmos has no temporal beginning but is a natural logical product of the divine One. By His very nature, the divine One produces an ordered and good cosmos that does not succeed Him in time, only in logical order and in existence. Avicenna worked out a logical proof of the existence of God: we know from our phenomenal experience of the world that things exist; no entity can exist without a cause; the chain of causality cannot be infinite but must ultimately arrive at a First Cause, which is God. Being was divided into three classes: the necessary, the possible and the impossible. The First Cause is by its own nature, necessary, and the characteristics of the first cause endow all contingent entities with necessities of their own, in a descending hierarchy of necessity which culminates in all sublunary things. Avicenna made a distinction between essence (what something is) and existence (the fact that something exists). For an essence to be realized within time (as an existence), the existence must be rendered necessary by the essence itself. This particular relationship of cause and effect is due to an inherent property of the essence, that it is non-contingent. Avicenna employed logic in the service of metaphysics, as a means of understanding Islamic religious doctrine and even interpreting the Qur'an. Logic was a standard for judging concepts acquired through the four faculties of reason: sense perception (al-hiss al-mushtarak), retention (al-khayal), imagination (al-mutakhayyila) and estimation (wahm). Among these, imagination was the key, since it could compare and relate new phenomena to existing concepts. Logic could also be used to make deductions and acquire new knowledge, and to judge the validity of arguments. Gaining knowledge was essential to training and perfecting the intellect in order to attain salvation. Logic was also a means of communicating knowledge to others. Avicenna’s epistemology is based on a theory of soul that is independent of the body. His Fi’-Nafs/De Anima (Treatise on the Soul) begins with the so-called “flying man” argument: if a person were created in a state of perfection, but blind and unable to perceive anything through his senses, and suspended in the air, would he know that he existed? He could not doubt his existence, because he was thinking, but he would not be able to confirm the existence of his physical body. This argument is used to affirm the soul’s existence and capability to be aware of itself independent of the body. In Avicenna's account of creation (largely derived from Al-Farabi), the creation of the world proceeds from the First Cause (or First Intellect). The First Intellect, in contemplating the necessity of its existence, gives rise to the Second Intellect. In contemplating its emanation from God, it then gives rise to the First Spirit, which animates the Sphere of Spheres (the universe). In contemplating itself as a self-caused essence (that is, as something that could potentially exist), it gives rise to the matter that fills the universe and forms the Sphere of the Planets (the First Heaven in al-Farabi). This triple-contemplation establishes the first stages of existence. It continues, giving rise consequential intellects which create between them two celestial hierarchies: the Superior Hierarchy of Cherubim (Kerubim) and the Inferior Hierarchy, called by Avicenna "Angels of Magnificence." These angels animate the heavens; they are deprived of all sensory perception, but have imagination which allows them to desire the intellect from which they came. Their vain quest to rejoin this intellect causes an eternal movement in heaven. They also cause prophetic visions in humans. The angels created by each of the next seven Intellects are associated with a different body in the Sphere of the Planets. These are: Saturn, Jupiter, Mars, the Sun, Venus, Mercury and the Moon. The last of these is of particular importance, since its association is with the Angel Gabriel ("The Angel"). This Ninth Intellect occurs at a step so removed from the First Intellect that the emanation that then arises from it explodes into fragments, creating not a further celestial entity, but instead creating human souls, which have the sensory functions lacked by the Angels of Magnificence. For Avicenna, human minds were not in themselves formed for abstract thought. Humans have only the potential for intellect, and only illumination by the “Angel” confers upon them the ability to actualize this potential. This human intellect is the Tenth Intellect. The degree to which minds are illuminated by the Angel varies. Prophet/Prophets are illuminated to the point that they posses not only rational intellect, but also an imagination and ability which allows them to pass on their superior wisdom to others. Some receive less, but enough to write, teach, pass laws, and contribute to the distribution of knowledge. Others receive enough for their own personal realization, and still others receive less. According to this view, all humanity shares a single agent intellect, a collective consciousness. The final stage of human life, according to Avicenna, is reunion with the emanation of the Angel. Thus, the Angel confers upon those imbued with its intellect the certainty of life after death. For Avicenna, the immortality of the soul is a consequence of its nature, and not a purpose for it to fulfill. The most important of Avicenna’s 16 medical works, the 14-volume Qanun (The Canon of Medicine), contains over one million words and is divided into five books. The first gives general principles of medicine; the second is an alphabetical listing of simple drugs; the third deals with diseases of particular organs and parts of the body; the fourth with diseases which spread throughout the body from an initial starting point, such as fevers; and the fifth with compound medicines. The work classified and described diseases; outlined their assumed causes; and covered hygiene, simple and complex medicines, and functions of parts of the body. It asserted that tuberculosis was contagious, and described the symptoms and complications of diabetes. The “Canon” was translated into Latin in the twelfth century and remained a major textbook for medical students in Europe for several centuries. In the museum at Bukhara, there are displays showing many of his writings, surgical instruments from the period and paintings of patients undergoing treatment. Avicenna was interested in the effect of the mind on the body, and wrote a great deal on psychology, likely influencing Ibn Tufayl and Ibn Bajjah. Along with Rhazes, Ibn Nafis, Al-Zahra and Al-Ibadi, he is considered an important compiler of early Muslim medicine. Avicenna’s major work, al-Shifa' (The Cure), was translated into Latin in twelfth and thirteenth century Spain (Toledo and Burgos). His ideas, particularly on the nature of the soul and the difference between existence and essence, had an important impact on medieval scholastic philosophy. These raised considerable debate in the Roman Catholic world, and Avicennism was proscribed in Paris in 1210. The work of Thomas Aquinas was influenced by Avicenna’s metaphysics; and William of Auvergne and Albertus Magnus by his psychology and theory of knowledge. In the Islamic world, where he also generated extensive debate and argument, Avicenna set forth a sound philosophical system rooted in Islamic theology. Decades after his death, two Islamic theologians al-Ghazali (d. 1111) and al-Shahrastani (d. 1153) attacked him as a representative of philosophy. Both al-Shifa’ (The Cure) and al-Isharat wa’l-Tanbihat (Pointers and Reminders) became standard philosophy texts in Islamic schools. Suhrawardi Maqtul (c. 1155 – 1191), the Sufi mystic who later founded illuminationist philosophy, used much of Avicenna’s work as his foundation. In later Iranian tradition, commentators added mystical insight to his ideas and he came to be regarded as a mystical thinker. In Iran, Avicenna is considered a national icon, and is regarded as one of the greatest Persians to have ever lived. Many portraits and statues remain in Iran today. An impressive monument to the life and works of the man who is known as the 'doctor of doctors' still stands outside the Bukhara museum and his portrait hangs in the Hall of the Faculty of Medicine in the University of Paris. There is also a crater on the moon named Avicenna. Wisnovsky, Robert. Avicenna's Metaphysics in Context. Duckworth Publishing, 2003. "Abu Ali al-Husain ibn Abdallah ibn Sina (Avicenna)" MacTutor Biography. Raul Corazzon The Essence-Existence Distinction, The Ontology of Ibn Sina (Avicenna) "Ibn-Sina (Avicenna) on the Subject and the Object of Metaphysics"
This page was last modified on 3 May 2016, at 14:58.